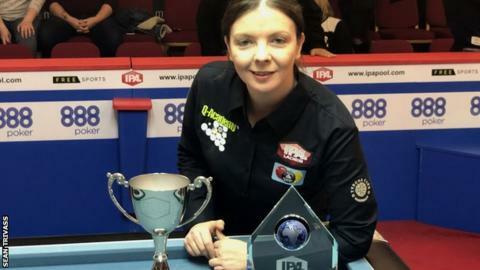 IPA world blackball pool champion Emma Cunningham wants to win this weekend's Irish Open - and then sweep the next four events in the season. Cunningham, from Newry but based in England, comes into the event after beating Kerry Griffiths in the world final two weeks ago. "I'd love to do the sweep," said Cunningham, who won three of last year's five Tour events. "I love playing pool in Ireland. I have family, friends and team-mates there." Cunningham, ranked first in the IPA standings, describes herself as "very competitive" and had to regroup last year after losing in the group stages at the European Open. "I've learned my lesson - I wasn't very well prepared," she told BBC Sport. "I got a little upset about it and it took a little more time on the practice table for me to come back from it." Although she is on home ground in Northern Ireland, she accepts it will not be easy. "There's 32 players in it this year and several good players. Nat Madden won some events last year and Deb Burchell is back playing. Also Lauren [Williams], my partner, she got to a final last year. "I've been drawn in the same group as my partner and one of my team-mates. "It would have really been the group of death if my sister Mary had been drawn in there too - she plays for Northern Ireland." One point per ball that goes fully past an imaginary line between the middle pockets and/or one point per ball legally potted. Failure to reach the three-point minimum is a foul break. Skill shot: It's OK to pot your own and your opponent's ball at the same time - this rewards attacking play by 'unblocking' pockets.